The next stop on our trip up to Northern Ireland was actually IN Northern Ireland. We stopped in Belfast to take a tour given by the Black Taxi Tour Group. We split into two taxis but stopped periodically to get out, take photos, and receive lessons in history as a large group. Fortunately most of us students are taking history courses and have learned a bit about the recent political history in Northern Ireland. I’ll do my best to fill you in. In 1800 Ireland signed the Act of Union with Britain thus entering the United Kingdom, giving up the Irish Parliament, and taking seats in Westminster (Britain’s Parliament). In the late 19th century, Ireland began to seek Home Rule. They wanted to govern themselves once more and rule from Ireland. However over the century the people of Ireland had split into Nationalists and Unionists. The distinction obviously being people that supported a self-governing Ireland, and people that still supported the Union. Ireland finally gained Home Rule in 1914, but it was immediately put on the back burner since good ole Franz Ferdinand was assassinated and began the outbreak of the Great War. While Ireland remained neutral, all of their government was still taking place at Westminster in Britain – obviously contenders in the war. In Easter 1916 some boys down here in Dublin got tired of waiting for Home Rule to happen and took matters into their own hands. What widely became known as the 1916 Rebellion which I mentioned when I visited Kilmainham Gaol. In the meantime religious leadership had come into play. See, when Ireland became part of the UK many Anglicans moved to Ireland and became known as the Anglo-Irish. They were mainly Protestant while the majority of the Irish were Catholic. Since the Irish were being displaced the Anglo-Irish Protestant Unionists came into wealth and power, especially in Northern Ireland. When Ireland finally signed the deal with Britain for Home Rule there was a lot of resistance in Northern Ireland and the deal basically gave Ireland back the 26 lower counties which became known as The Republic of Ireland, and Britain maintained control of the northern 6 counties which became Northern Ireland. This separation of Ireland is known as the Partition. Jumping ahead a few decades we get to the 1960’s. There’s sort of a worldwide civil rights thing going on, you might have heard of it. The Irish Republican Army started getting active in Northern Ireland because the people up there were sick of the inequality between Catholics and Protestants. The inequality was especially apparent when it came to things like employment, voting, and real estate. This caused emigration mainly among the Catholic sect since they were being treated most unfairly and is probably how in America we received such a large Irish Catholic population. Anyway, in the 1960’s there was an outbreak of violence because the British government basically turned a blind eye to the oppression and the people of Northern Ireland decided to finally take matters into their own hands. This started what became known as the “Troubles” during which there were bombings throughout Belfast, crimes of arson and acts of ill-intent towards people of a different religious background. 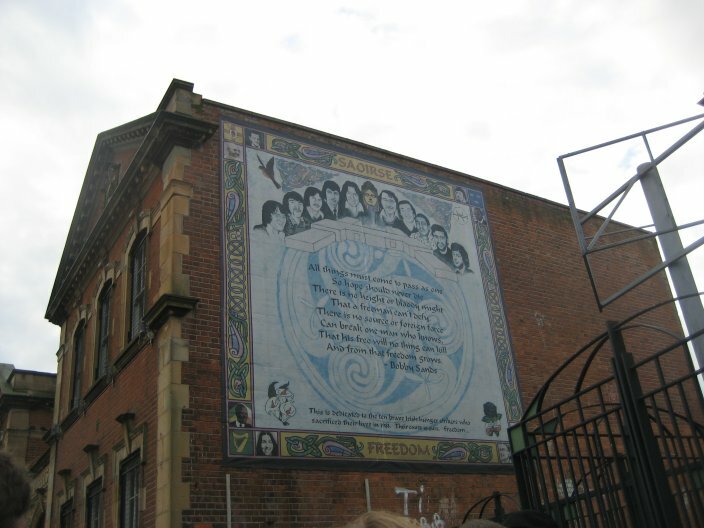 The Troubles lasted until 1998 when the Good Friday Agreement was signed by eight parties – it was a document agreed upon by northern Protestants and Catholics alike, and even was supported by the Republic. I am leaving a LOT out, but you can look up the Troubles on Google if you’d like to know more about it! Below are some of my pictures from the trip. 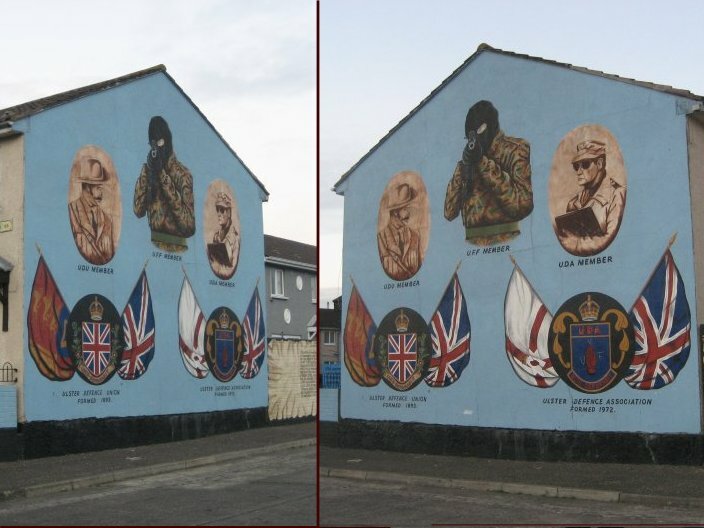 During the Troubles a lot of murals started showing up on buildings around Belfast depicting scenes as viewed by either Catholics (in their part of town) or Protestants (in their part of town). 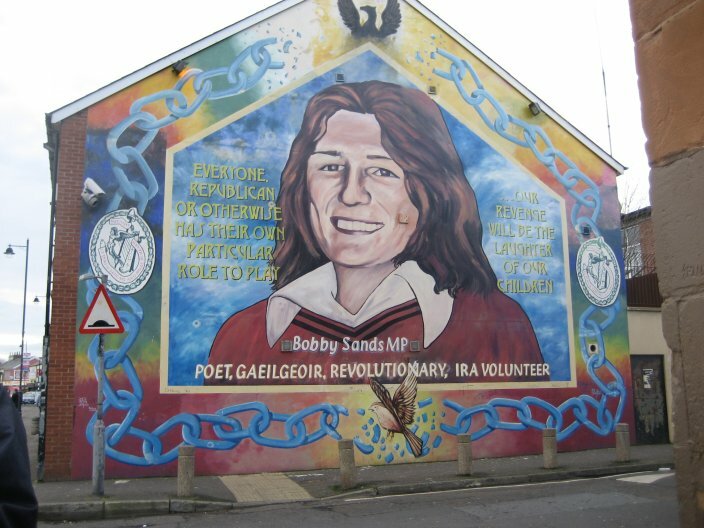 This first one is an image of Bobby Sands (yes, he IS a man) who was a leader in the Irish Hunger Strike in 1981. On May 5th, 1981 after 65 days on hunger strike, Bobby Sands was the first of the participating prisoners to die. 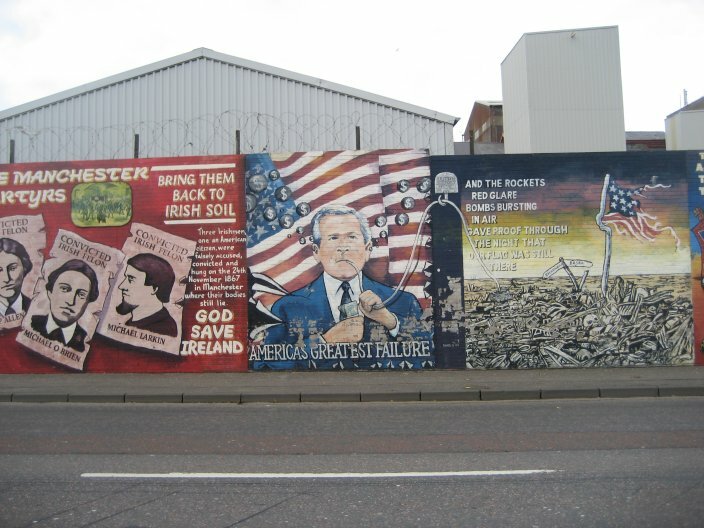 This is probably the most famous Belfast Mural. The gunner in the middle follows you wherever you walk. I tried to show it through my photos, but it was a very surreal experience walking every which way around him and to always have his gun targeted on me. 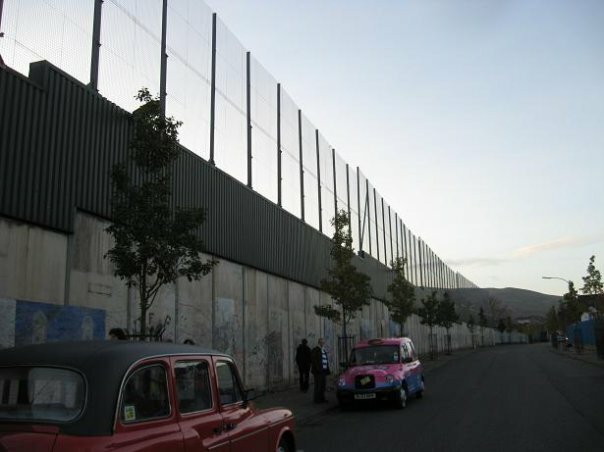 This is the Peace Wall that was erected in the 1970’s as a barrier between Catholic and Protestant homes. 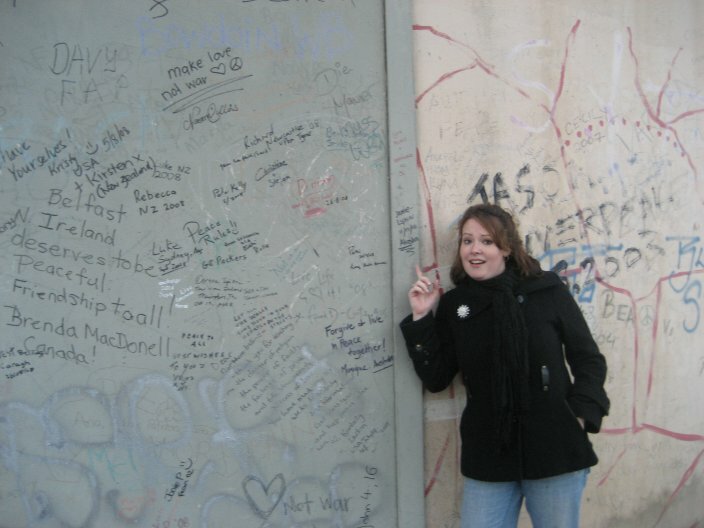 Even though the Troubles have been over for 10 years now the walls will not be taken down for another 20 years. The idea is that people my age only have childhood memories of the wall and most people in my generation are peace advocates. Many people in my generation are beginning to have children and by the time those children are becoming active members of society in their 20’s – they will have absolutely no recollection of the Troubles except through what has been told to them and the idea is that it will be safe to bring the wall down. Unbeknownst to me one of my fellow students captured a picture of me reading the wall. 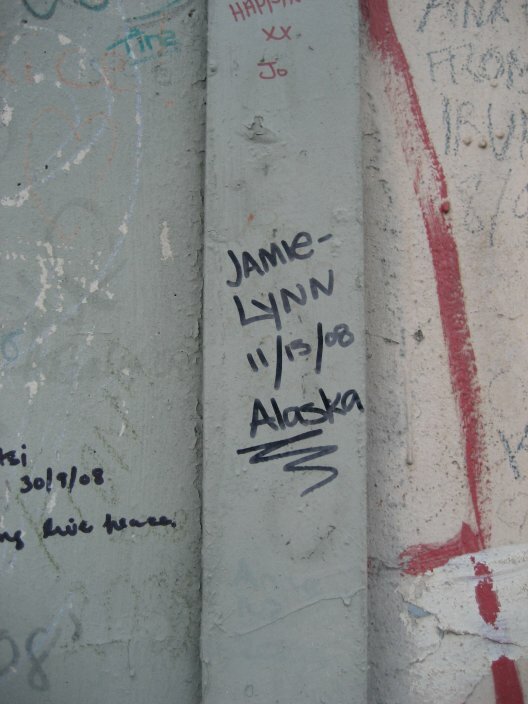 First to have background knowledge before traveling to Belfast of what happened and then to travel around and stand in the midst of where everything happened, reading the cries for peace on the wall was truly one of the most touching experiences of my life. We only stayed in Belfast long enough to finish the tour which I think was okay with everyone. Even though the violence is over and it probably would have been safe to stay there, I think we all felt a little unsettled and were glad to move on.